I visited Saudi Arabia recently on business. It is a country that is going through a fiscal crisis because of the fall in the price of oil, the main source of government revenues. As a result the government’s budget deficit reached 15% of GDP in 2015. That said, the country has large financial reserves. Salaries have been cut and subsidies on fuel, food, water and electricity are also being reduced. VAT and a tax on undeveloped land are being introduced. The State sector is 60% of the economy and the government is committed to increasing the role of the private sector. It is also committed to increasing the proportion of women in the paid workforce from 22% to 30%. The position of women is anomalous. They are not allowed to drive a car, but make up more than half of students in higher education. Meanwhile Saudi Arabia is the third biggest military spender in the world, and is engaged in an expensive civil war in neighbouring Yemen. In the longer run the prospects for Saudi Arabia are good. As well as oil, it has large untapped reserves of aluminium, gold, copper and uranium. It has a very large immigrant population. Only one fifth of the people working in the retail sector are Saudi natives. But the question must be asked if Saudis would work at the prevailing wage level in the sector, and , if not, if Saudi consumers would willingly pay the higher prices that would arise if immigrant workers were replace by Saudis. A similar debate is taking place in the UK and the US, where curbs on immigration are being advocated. Immigrants in Saudi Arabia send home $38 billion in remittance to families in their home countries,. So a downturn in the Saudi economy is keenly felt in countries like Egypt, Yemen, Lebanon and Jordan. Saudi Arabia is a relatively recent creation, dating from the early 20th century. 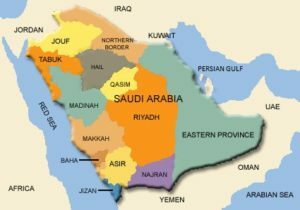 The Al Saud family were dominant in the peninsula in the 18th century, and were at the time allied itself with the Wahabi branch of Islam which came into being around then, an alliance that continues to this day. But the Al Saud family lost their strong position in the 19th century, eventually finding themselves exiles in the British protectorate of Kuwait. It was from there that they launched their comeback in 1902. Starting in Riyadh, the family, led by Abdul Aziz, gradually conquered most of the peninsula by a combination of force, guile and religious fervour. The only areas they did not eventually take over were Yemen and the British protectorates along the Gulf (now UAE and Oman). Then oil was discovered and their position was immensely strengthened. Initially much of the benefit of the oil discoveries went to the US investors, but following the oil crisis of 1973, Saudi Arabia took control of its oil. Saudi Arabia, is a mix of tradition and modernity. There are brutal aspects to its traditions, like the extensive use of the death penalty. It has a very youthful population, some of whom have been attracted to terrorism. The country needs to find a more constructive outlet for their energies. So the country’s successful economic transformation is politically important for the world.